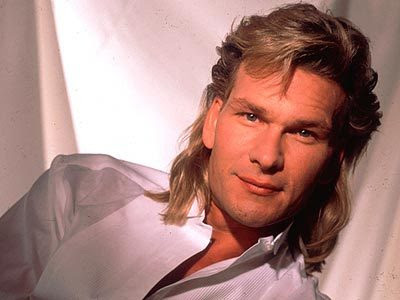 Please don’t misunderstand: Patrick Swayze and I weren’t bowling buddies or anything like that, and I don’t want to sound like I’m trying to pass myself off as someone grieving for a close, personal friend. But I find myself deeply saddened by his demise – and, yes, more than a little peeved that, being caught up in the Toronto Film Festival right now, I don’t have nearly enough time to write a farewell worthy of the guy. Our paths crossed several times over the years, due in no small measure to the fact that he was a Houston native, and I started interviewing him for The Houston Post as far back as The Outsiders (1983). I have very happy memories of a lunch we shared at a downtown H-Town restaurant in 1987, just before Dirty Dancing opened. He knew he was the verge of a major career breakthrough – and he was so openly, eagerly exuberant that I experienced a kind of contact high just sitting near him. I remember an uproarious incident during the press junket for Point Break in the Loews Santa Monica Beach Hotel. I was walking toward my room after a morning of roundtable interviews when I heard Swayze shouting my name from across the atrium. When I turned to respond, I saw he was on a floor two stories above mine, with one leg draped over the railing, pretending he was preparing to dive into the lobby far below. So I had to shout back in response: “Don’t do it, Patrick! You have so much to live for! The movie’s not that bad!” He laughed so hard, I momentarily feared he might lose his balance and really take the drop. I laughed, too, but I didn’t actually smile until he took his leg off the railing. I don’t pretend to have known the man very well, but, as I say, I always enjoyed talking with him, and always appreciated his seemingly boundless enthusiasm. I cannot believe there isn’t a place somewhere on the other side where such a vital spirit can continue to thrive. More, later. Great photo, great post. I was very saddened to hear of his death although I've been expecting it at any moment. Over the weekend the Fox Movie Network showed "Point Break," which is a guilty pleasure of mine that I've seen several times. Great action, and I just like looking at Patrick and Keanu Reeves. Patrick had charisma to spare. As he said when he bailed out of the airplane, "Vaya Con Dios."